The University of Florida men’s tennis team fell, 4-3, against the University of Miami in the second round of NCAA Tournament play Saturday at Linder Stadium at Ring Tennis Complex. 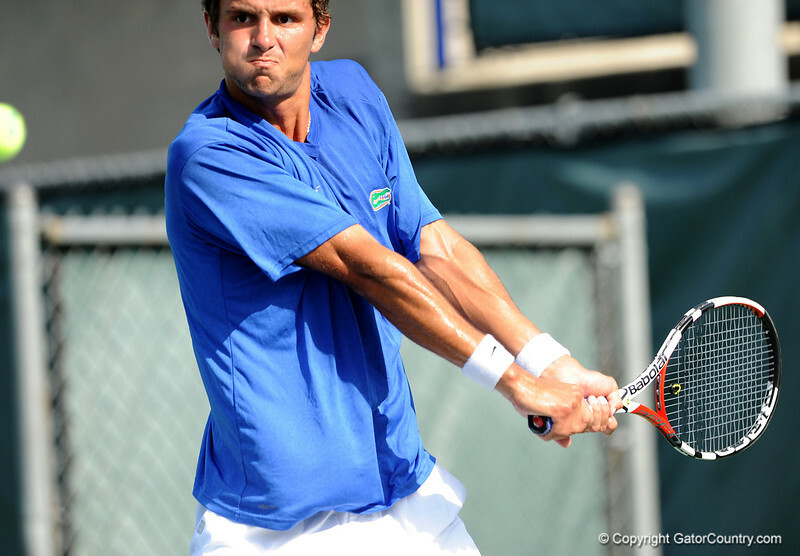 The day’s action came down to a final set at third singles between UF’s Antoine Benneteau and Miami’s Carl Sundberg. In a contest that ended more than three hours after singles play began, Sundberg won the deciding set, 6-1, to clinch the match and earn a trip to the Round of 16 for the Hurricanes. The Gators narrowly missed the chance to clinch even before Sundberg and Benneteau began their third set. No. 23 Carlos Cueto served at 5-4 in the third set for what would have been the clinching point. But No. 13 Daniel Vallverdu broke Cueto’s serve, then managed to hold serve and break once again to win, 4-6, 6-2, 7-5, and set up the final act on court three. The day began with Cueto and Alex Lacroix cruising, 8-1, at third doubles in 30 minutes. After taking a 7-0 lead on court two, Jeff Dadamo and Johnny Hamui saw their lead shrink to 7-5 as their serve was twice broken. Dadamo, however, held serve in the 13th game to win 8-5 and clinch the doubles point for the Gators. The day, which included first-round NCAA action on the women’s side, drew 490 people to Linder Stadium at Ring Tennis Complex.